When you pick up a novel, you're entering into a tacit agreement to suspend your disbelief – or at least try to. In science fiction, this is an implicit requirement of the genre: you agree to believe in whatever world the author has created provided what happens there is logical within that setting. In more realistic fiction, the suspension is more subtle, but it's still there – you have to at least sort of believe that story is possible in order to become invested in the characters – and I like to think I've become pretty good at immersing myself in the world of each book I read, not questioning the author's choices unless something really doesn't add up. In straight fiction this is pretty easy and I do it without thinking about it; in fiction based on real events and/or people, thought, I sometimes get tripped up. Would they really have thought that? I wonder to myself, and then find myself searching for historical inconsistencies. It's annoying, but it isn't something I can usually control. 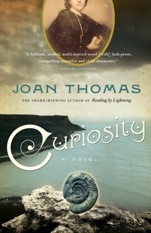 When I read Joan Thomas' Curiosity, though, I was so quickly pulled into the story that I didn't have time to nitpick – my disbelief nowhere to be found in the face of such a fascinating story. Curiosity alternates between the lives and perspectives of two characters: Mary Anning, a poor girl living in Lyme Regis on the English coast, and Henry de la Beche, an upper-class boy expelled from military college. Both Mary and Henry are fairly young when the novel begins (9 and 14 perhaps) and over the course of the book their lives converge and they grow up. But this really isn't a coming of age novel in the traditional sense, and what intrigued me wasn't so much the suggestion of an impossible love story between Mary and Henry, but rather the emergence of the science behind fossil collecting and the discovery and attempts to understand the first dinosaur skeletons. When the novel opens, Mary is just a little girl collecting curiosities with her father on the beach and later selling them as charms to the wealthy people who visit Lyme Regis to take the cure of bathing in the cold sea. She sells the curios – ammonites, mostly – as charms against blindness. Although no one really knows what they are (they claim they are stone snakes) all understanding of the fossils are filtered through religion. There are rumours that dragons once lived on the shore and were turned to stone during the great Biblical flood, buried for their wickedness. The local clergyman tells Mary it is a sin to collect curiosities, which he says are the work of the devil. Before long, though, she encounters a stranger on the shore who turns out to be a minister himself. He is also collecting fossils – everything on Earth, he explains, is the the work of God – and he offers her and her father £20 for the discovery of a complete crocodile skeleton, which he believes is buried in the cliffs. Mary's father becomes obsessed with finding the crocodile – £20 being more money than the family has probably ever had at one time – and after searching one night falls off the cliff. He survives the fall, but eventually succumbs to his injuries, leaving Mary and her older brother responsible for the family's well being. Months later, there's a storm that rips part of the cliff away, dropping a giant crocodile-like head onto the beach. Mary spends months chipping the fossilized bones from the surrounding rock and not long after, another storm provides her access to the rest of the body. By now she's 12, and she sells the complete skeleton for £21. By this time, Henry has arrived in Lyme Regis (his mother has married a man who lives there) and he is onsite to see the body of the massive crocodile-like beast raised from the hole where Mary has excavated it. Henry is fascinated by the cliffs and the fossils and, as he sets out to be a geologist, Mary helps him find his way around the beaches of Lyme Regis. The friendship they form breaks all the rules of propriety and class, but Henry decides he doesn't care because Mary's insight into the fossils they discover, and her specialized knowledge of the region, are invaluable resources. Mary continues to be incredibly successful as a fossil hunter. She uncovers several new species of animals – all of which are credited to the men who buy the skeletons from her – and as she continues to find larger and stranger animals, she begins to move away from the theory that all the animals perished in Noah's flood. On the Origin of Species is still decades away, though, so she has very little to base her burgeoning ideas on, but as Henry's thoughts begin to travel in the same direction, he moves away from his fossil-hunting friends in the clergy to more scientific hypotheses. I have focused mostly on the science side of Curiosity but that's not an entirely accurate portrait of Thomas's novel, which goes deep into the home lives of both Mary and Henry, and looks at what life was like for two very different classes during the early 1800s. Both Mary Anning and Henry de la Beche were real people – Thomas's 'Author's Note' details some of her research – and the reconstruction of their lives is astonishing. Curiosity is fiction, but it nonetheless follows a real timeline and, where possible, real events, and at long last gives Mary Anning her scientific due. Although I'm able to suspend my disbelief for all manner of worlds, reading about a time before the theory of evolution, before the very idea of dinosaurs existed, was a real test. That Thomas was so able to place herself in that period and write about the early scientists without even a hint of an eye-roll or a weren't they primitive? tone is what makes Curiosity as fascinating and engaging as it is. It also gave me a newfound respect for early science and, indeed, for modern science, because who knows what will seem obvious in 200 years that completely eludes us now. 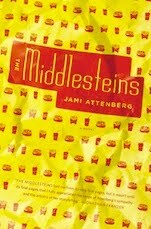 I said before that Curiosity isn't a traditional coming of age novel, and that's true. Rather than focusing on how characters grow up, Thomas offers us a look at how our collective understanding started to grow, complete with the disbelief, angst, confusion, and the defiant certainty exhibited by anything about to take on a life of its own. This sounds really, really interesting. The entire time I was reading your review I thought of Remarkable Creatures by Tracy Chevalier- I haven't read it yet but it's been on my radar for a while- I wonder if they're similar at all.